Amana Arts Guild will host the Christmas Haus Tour again this year. It is an event filled with lovely traditions and whimsical surprises. 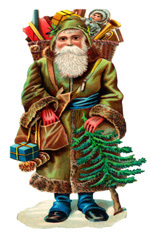 Here during this festive season the Amana Arts Guild welcomes visitors to its 10th annual Christmas Tour of homes. Progress has not eradicated the town’s treasured traditions and quaint customs. Amana’s cedar sided, limestone and time bleached brick buildings have weathered well over a century. Tour private home decorated for the holidays and take part in the ambience of Christmas in the Amana Colonies. Visit with homeowners and get to know the colonies in a whole new way while you visit homes with stories as remarkable and varied as the colonies themselves. While in the area visit the Tannebaum Forest open November 27th to December 20th, this enchanted forest at the Festhalle Barn is created by local businesses, artists and volunteers. Live Christmas trees inspire holiday wishes while you visit with Santa and see the 17 foot tall handcrafted Weihnacht’s Pyramid. Also enjoy Prelude to Christmas December 4-6, the Colonies advent celebration. Shop on candlelit streets in the village of Amana and visit the Amana Church Bazaar and Cookie Walk. During a Glimpse of Christmas Past December 5-6, you’ll enjoy a program of songs, poetry and storytelling that lets you experience a Christmas in communal Amana a century ago.